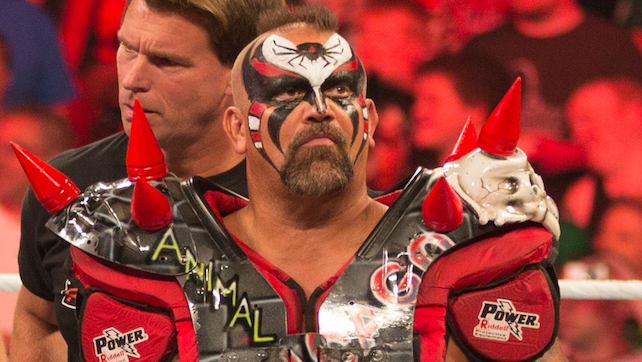 Road Warrior Animal took to his What A Rush podcast and as always, wasn’t one to mince words. Animal opened up about WWE TLC, Becky Lynch, ‘This is boring’ chants, and much more. Highlights appear below. If the McMahons are really listening to the fans and they want to do what they have to do to make the fans happy, you have got to have a line drawn in the sand on who the bad guy is and who the good guy is. That’s what the fans want. They want someone to believe in. They want someone to cheer. They want someone to boo. They want someone to hate. You can’t change the wrestling business that’s been based for 150 years on this kind of principle. Now all of a sudden you have good guy vs good guy. Come on, they want to have a line drawn in the sand because when you make it too confusing for them they can’t cheer for Asuka in the same way and all of a sudden cheer for Becky Lynch in the same match. You just can’t do it and it ends up making the match horrible. There is a problem in the wrestling business. Yes, the women’s movement is growing, but when the women are the main event and they have the best matches on your card, there’s an issue. At the end of the day it’s guys like yourself and people that sell sponsors and buy tickets that call the shots. When they’re chanting, ‘This is boring,’ what does that tell you? To me, as a performer, there was nobody stepping up a gear. When there was time to get heat there was no stepping up the gear and being real deviant and getting heat. It was just moves after moves trading moves. Seth Rollins [was] doing the same thing; run and dive out the ring, go around the corner and the ring post, come in and dive out the ring again. It’s the same crap all the time. Every match has the same crap…..you see the same repetition thing in their match. That’s why people chant ‘This is boring.’ I’ve never had one person chant, ‘This is boring’ at one of my matches. Even in the beginning when we stunk they didn’t chant ‘This is boring.’ That is bad for the pay-per-view. You’ve got a guy that’s 185 pounds soaking wet – nothing against Tyler Breeze, he’s funny with Fandango. He’s a job guy in the wrestling business. That’s all he’s done is get beat and put people over. You’re gonna put him against someone that’s fighting for a championship belt? How much sense does that make? It doesn’t make any sense whatsoever and the fans see through this. Don’t even get me started about Daniel Bryan. His merchandise sales have been non-existent, like zero, since he turned heel. There was your hottest selling merchandise guy besides New Day and he’s selling nothing. If I hear one more time, ‘The new Daniel Bryan,’ come on. They get the point already after a month. They’re getting it; they understand you’re a heel. I know he’s trying to get heat, but he’s not getting much heat. I feel sorry for AJ Styles. They should have never taken the title off of him. They should have done something to make maybe AJ Styles and Daniel Bryan a tag team together. They’d be a great team because they’re both great workers. The problem is they’ve got no other heel team they could wrestle. Don’t even get me started about those two. Gallows comes out there with a rhinestone stud setter set trying to look like a tough guy. He’s got lycra tights. You can’t be a tough guy wearing plastic lycra tights. Then his partner, his brother, wears blue tights and then Gallows has got black. What other tag team do you know that’s cohesive that does not match? All the great tag teams had similar gimmicks with each other. Now you’ve got two guys that look totally opposite being a team. It doesn’t make sense. It’s not smart business and I’m surprised nobody went up to them on their way to the ring and said to the small guy, ‘Where’s your black tights? Why you got baby blue?’ He had baby blue tights on yesterday. They offer you nothing…..maybe Gallows & Anderson are disheartened. I can see that, but they’re not offering anything to the wrestling business right now. Nothing’s gonna change. That whole crap on TV about how this is gonna be new and improved and they’re gonna listen to you: that’s a lie…they’ve said this before on air with WWE. It’s not gonna change. They’re gonna make the rules. They’re gonna make the decisions and nothing’s gonna change. I would let her back off of ‘The Man’ thing and let her just be a pure white meat babyface that doesn’t quit. Those are the kind of babyfaces that work. When you come out there with the attitude and strutting your stuff like she’s some kind of tough guy, come on! Jesus, Lord, anybody that’s ever been in a fight can see right through it and I’m just being realistic because that’s what works in this business. You’ve got to think shoot and work the shoot and right now they’re not taking advantage of their stars who are stars. This thing with The Anvil is not out of respect. You don’t go out there and trash his picture. You don’t go out there and trash the jacket. You don’t go out there and break his sunglasses. You don’t go out there and take advantage of someone’s death to create an angle. I don’t believe in that. I think that’s hitting below the belt and no different than when Hawk had substance abuse problems and they had him do that drunk thing when he fell off the Titantron. That was hitting below the belt. It’s too close to home. You could have done it different ways with Natalya dedicating stuff to her father without having to try to tarnish his name a little bit.